"Here's the idea: we take the liquid produced by marinating fresh cherry tomatoes in salt, pepper and vinegar, and strain it into a pan. We then take this already delicious juice, and make it even more so by reducing it over heat. 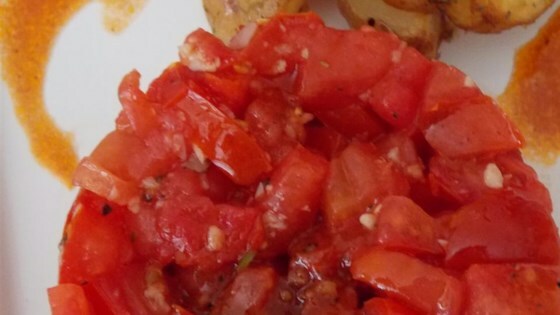 This intensified liquid is poured back into the tomatoes and we have a great fresh tomato relish that we can use to top grilled meat, chicken, or fish." Stir tomatoes, olive oil, red wine vinegar, garlic, salt, and pepper together in a bowl. Cover the bowl with plastic wrap and refrigerate until flavors blend and juice accumulates, about 30 minutes. Strain accumulated juices into a small skillet and transfer tomatoes back to the bowl. Cook juices over medium heat until liquid reduces and sauce has a syrup-like consistency, 2 to 3 minutes. Pour sauce back over tomatoes into bowl and stir. This just wasn’t hugely flavorful. Maybe it needs more time in the fridge or some red pepper or something. Nice and refreshing alternative to heavier sauces.